We have recently acquired a new visitor to our office: A Green Iguana who lives in the trees behind our building and occasionally stops by in front of our window. Green Iguanas can be found in the rainforests of Central America and the Caribbean, as well as in parts of South America. Even though they seem slow at first, they are surprisingly agile and (as I can observe from the office as I write this) very good climbers. And if they ever happen to fall, they can survive falls from as high as fifteen meters (50 Feet)!Iguanas are quite good swimmers as well (they use their long tails for moving along) and usually live near water. Counting their long tails, these Lizards can grow to a length of almost two meters (6 feet) and can be up to 5 Kilos in weight. 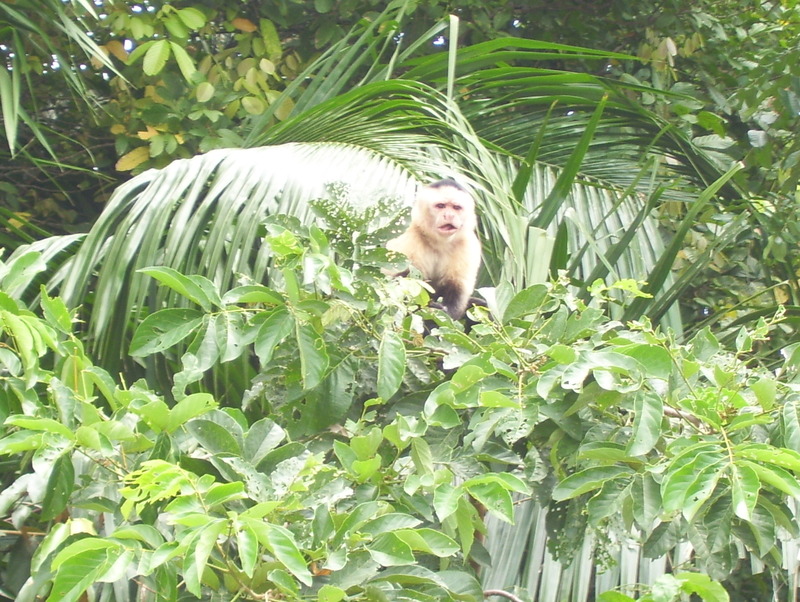 During the day they move through the branches of the forest, where they forage for fruit and leaves. Usually the Green Iguana is a very peaceful animal who prefers to flee before it has to fight, and it can even cast off its tail to get out of a dangerous situation. If escape is not possible, the Iguana can use its long tail like a whip to defend itself. 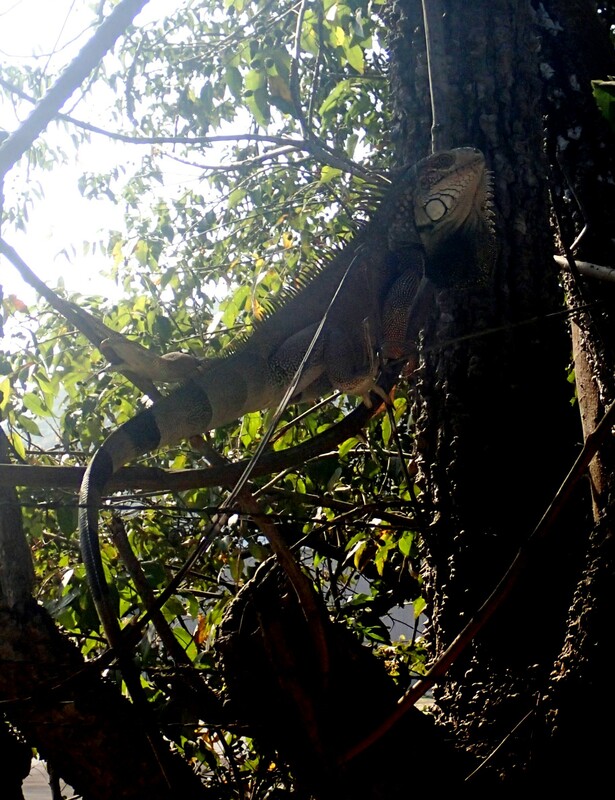 We were, of course, wondering whether “our” Iguana is a male or female, but our operations manager Laura could help us out there: The one in front of our window is a male, recognizable by the thick spines on his back and the dewlap under his chin. During the mating season he shakes his head up and down to show off this dewlap and attract females. In Panama and Costa Rica, the Iguanas have received the nickname “Gallina de Palo” or “Chicken of the Tree”, in reference to the fact that the local cultures have been using these lizards as a popular food source. These days, Iguanas are not commonly eaten anymore, but they now face another danger: the American pet trade. Apparently, Green Iguanas are hugely popular as pets, and their species has been reduced to the point that they have been added to the CITES (Convention on International Trade in Endangered Species of Wild Fauna and Flora) Appendix II, which means “their trade must be controlled so as to not harm the species in the future”. 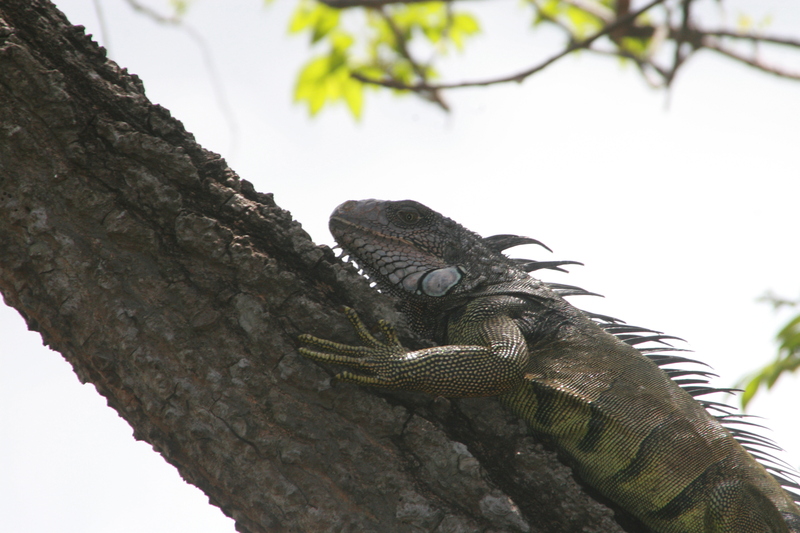 The Green Iguana is a truly fascinating creature and watching it climb a tree is definitely a thing worth seeing. Two new frog species were discovered just northeast of Panama City. Unfortunately they may be among the next victims of the fatal fungal disease decimating highland frogs worldwide, Batrachochytrium dendrobatidis. Anomaloglossus isthminus, first collected in 1974 near the El Llano-Cartí Road, was mistakenly called Colostethus chocoensis. STRI’s Roberto Ibáñez and César Jaramillo found the same species in streams at two more locations during a 1997 survey of the Panama Canal watershed. This species made the short list of endangered frogs to be saved by the Smithsonian’s Panama Amphibian Rescue and Conservation Project. Taxonomist Charles Myers at the American Museum of Natural History realized that this was a new species by examining the specimens’ tongues. Among the few specimens examined, he identified a second closely related species, collected in the indigeous comarca of Kuna Yala in 1985 by Jorge Roldán. Myers named this one Anomaloglossus astralogaster for the starry pattern on its belly. Captive breeders need tens of individuals to save a species from extinction. So far, too few of these frogs have been found to successfully breed them in captivity.